July 5th 2012 marked the 50th anniversary of Algeria’s independence. Albert Camus’s 100th birthday was celebrated a year later, on November 7th 2013. To many Albert Camus came to represent Algerian literature even though he, a pied noir, came from a European (French/Spanish) family and moved to Paris in the early 1940s. The fact is, the celebration of Albert Camus’s literature in the West, especially since the publication of The Stranger in 1942, has obscured a much larger body of Algerian writing which includes the works of Kateb Yacine, Mohammed Dib, Jean Amrouche, Mouloud Feraoun, Leila Sebbar, Assia Djebar, Yousef Sebti, Noureddine Tidafi, Tahar Djaout and many others. 2013 also marks 40 years since the assassination of Jean Sénac. 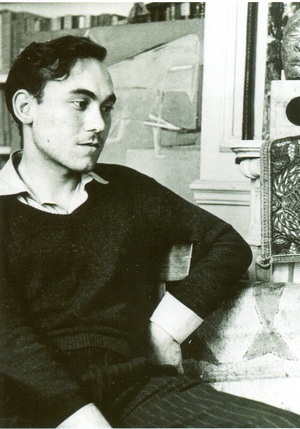 Sénac was also a pied noir poet, and was Camus’s protégé for over ten years until they diverged over the Algerian War. While Camus was in favor of a “peaceful” solution to the Algerian conflict, which would maintain French presence and influence, Sénac was adamantly in support of an independence he foresaw from the very beginning. The significance of the life and work of Jean Sénac, one of Algeria’s most influential 20th century poets, is yet to be recognized. Most of his work remains to this day untranslated. Sénac, who shared very similar European roots with Camus (both had Spanish mothers), is a rare if not unique example of a pied noir poet who not only wrote fervently revolutionary and patriotic poetry, such as Matinale de mon peuple (Dawn of my People, 1961), and Citoyens de beauté (Citizens of Beauty, 1967), but was a defining figure of Algeria’s cultural scene both before and after Algeria’s independence. The reasons for Sénac’s marginality in both French and Algerian literature are connected to the political circumstances of the Algerian War and Revolution and to the politics of his poetry which simultaneously condemned French colonialism and the post-independence military governments which he thought had betrayed the Algerian people. Most controversial, though, was his open homosexuality in the poetry he wrote after 1965, in which he tied his personal sexual liberation to fundamental aspirations of the Algerian revolution. Sénac promoted many Algerian artists, writers and poets through the two literary journals he created—Soleil in 1950 and Terrasses in 1953. The wildly popular poetry readings that he organized at Radio Alger served as a forum where he presented not only young Algerian poets, but revolutionary poetry from all over the world, including American Beat and African-American poets. He was editor of several anthologies, and director of “Galerie 54,” which exhibited Algerian painters of the Nahda (Renaissance) generation. The Sun under the Weapons (Le Soleil sous les armes), originally published in 1957, is a remarkable attempt to draw together French and Algerian poets in a common cause against oppression. The manifesto was part of a series of conferences Sénac held in France at the height of the Algerian war as a way to rally the progressive young students of Paris to the revolutionary cause which poetry represented. Sénac promoted poetry as the voice of Algeria’s struggles against French colonialism, indicating that poetry in times of war serves not only as a rallying cry for the silent victims, but as a means to uphold human dignity and truth in the face of prosaic manipulations and propaganda. When witnessing the recent popular uprisings and potential civil wars sweeping across the Middle East, one finds a consistent thread in the poetic and musical expressions which spontaneously appear as in the latest example of Syria. In a recent article on Al-Jazeera, expatriate Syrian writer Ghias al-Jundi observes that poetry is “playing a huge role in Syria right now because […] lyrics are part of demonstrations," and that "[p]eople are singing these verses together in the streets." In the context of the current events in Egypt, Tunisia, Libya, Syria and Turkey, it is worth noting the silence of a giant North-African neighbor that fought one of the most brutal and symbolic wars against colonial oppression, from 1954 to 1962. The Sun under the Weapons is a clear example of the revolutionary potential of language and of the role it can have in voicing a common cause. While reflective of a different era, the following selections from this work, and the quotations of Algerian poetry that it incorporates bear both a historical perspective and a contemporary potential. Footnotes are those of the author, from the original text. Translator’s notes and explanations follow the text. What follows are excerpts from the complete translation of this manifesto. In the thick of the fray, desperately listening, the poet will live from the breath of his own people. He will translate its breathing, oppressed or radiant, the smell of mignonette as that of the mass graves. He carries the shared reasons, hope and pain, at their highest point of effusion. He sheds permanent light on their drama. He does not write history, but day by day and also by the tip of the sword, transcribes the History built by the people. He adds punctuation, balances the syntax and passes the baton to the watchful. He tears from the wounds the only words that will not perish. He derives universal signs from local action and permanence where man’s heart recognizes itself. His feet in the mud and the blood, through the dignity of art, he perpetuates the dignity of a cause. He opens both panes of the sun upon our tears. One must choose a party. Poetry remains “the single expression of man which is no longer ambiguous.” Eluard and Char affirm and prove it, along with Ganzo, in the dark meadows of France-of-the-Caves with respect to the Nazi torturers. And at the same time they show that the bitter greatness of weapons can erase neither the freshness of a blouse nor the path of schoolchildren. When they stand against the grocers and executioners with sometimes disproportionate violence, it’s simply because the arrogance of commerce and of hate restrict the light and mutilate the whole body of Beauty. Poets, we will maintain an inexhaustible nostalgia for Samothrace’s Victory smile and it is this desperate and lucid claim which helps us wield our pens against the conservatives who are satisfied with their ruins. The alleged phenomenon through which poetry becomes the most noble verbal expression of the events of History and, particularly, the most faithful reflection of the eras of national liberation, can be easily proven. This miracle is only the implementation of different natural orders. Our whole body refused it. from which freedom falls like an eagle. the great bitterness of the hives? The long cry of dogs in the night. We don’t need to be ashamed of such a constant wail. It only reinforces our current opinion, and by liberating us from our qualms it can only make us more intensely committed to our guerilla brothers. It’s not our fault if our peaceful calls, tirelessly repeated, have continuously struck the dikes of the Masters of the vine and the permanent Ambassadors of France’s shame! They veiled you with vermine! The artistic life in Algeria has been so humiliated, ransacked and given to the mediocre with the precise and vigilant complicity of the Administration, that the true creators had to flee, to Paris for example, in order to find the moral means through which to express themselves and to find an audience for their work. This was, among many others, the case for Albert Camus, Kateb Yacine, or the abstract painter Louis Nallard. By encouraging conformity (pseudo-orientalism, pseudo-school of Paris, pseudo-school of Algiers, etc...) and a false avant-garde, the public authorities have once more proved that all true art is dangerous, because it is fundamentally revolutionary and dynamic, and because it is connected to the live roots of the country. There in a huge case to be investigated one day on this question, which will reveal the despicable collusion, in Algeria, between the colonial powers and Atrophied Art. And that in all areas: literature, painting, architecture, music, theater, film, radio, etc... Do we know that the Cultural meetings at Sidi-Madani  were interrupted because the organizers, even though they were official, had dared to invite Paul Eluard, Vercors, Breton, and Jean-Paul Sartre? That a sound director at Radio Algérie was criticized for employing an “Arab” comedian in a “French” show? And that the film Les plongeurs du désert (The Divers of the Desert) by Tahar Hannache was boycotted by the general Government under the pretext that it was entirely financed, produced and performed by “natives”! All that is certainly logical. As soon as a creator chooses to express himself freely he opts for an independent mode of thinking and manifests it through a kind of terrorism of sensibility and intelligence directed against certain stagnating values. It’s normal that this type of man, through the exercise of this requirement, is able to understand and encourage the same tendencies when they appear in other areas of human activity. This awareness causes the intellectual to understand that his revolution is similar in its necessity and its ramifications, if not in its immediate expression, to that of the progressive political activist. To such a degree that the two eventually become one man, flayer of darkness, convinced by the Ultimate Battle and by the urgency of a Single Front. If the Algerian people are at war, it’s also because they demand the right to their poetry, their rights to Poetry. Ghias al-Jundi’s essay, A 'new poetry' emerges from Syria's civil war, can be accessed here. Ganzo: Sénac is referring to the poet Robert Ganzo (1898-1995) born in Venezuela and later established in Paris. Like René Char, Robert Ganzo was a fighter in the French Resistance and upheld the dignity of poetry in the face of atrocities. L’Action, also called L’Action tunisienne, was a francophone nationalist newspaper founded by Habib Bourguiba in 1932. Sénac is most probably quoting himself. ‘Transparencies,’ capitalized by the author, refer to the film transparencies used to develop prints. Henri Kréa (1933-2000) was a pied noir poet, dramatist and novelist whose mother was Algerian. Like Sénac, Kréa was committed in his writings to the Algerian Revolution. He resided in Paris since the early 1960s. Rolland Doukhan (b. 1926) [Sénac misspells the name] is an Algerian Jew, poet and novelist, native of Constantine. The Crémieux decree of 1870, granting Jews in Algeria French citizenship had effectively isolated them from the Arab Muslim population. Sénac cites Doukhan as part of Algeria's religious diversity and as an example of solidarity with the plight of the Arab Algerians. The Sidi-Madani conferences were held from December 1947 to March 1948. They were intended to be a gathering for writers, artists and intellectuals from France and Algeria in a spirit of mutual understanding and dialogue. Among those present were Jean Sénac, Albert Camus, Jean Cayrol, Emile Dermenghem, Emmanuel Roblès, Mohammed Dib, Ben Slimane, Mimouni, Mohammed Zerouki and Nabahni Kouriba. A repeat conference was planned but not authorized by the French colonial administration for political reasons which Sénac alludes to in his manifesto. For more information, see Les rencontres de Sidi Madani (Algérie), (Janvier-février-mars 1948) by Jean Déjeux, here. - Katia Sainson’s Selected Poems, translated with David Bergman in 2010. She also wrote “Entre deux feux”: Jean Sénac's Struggle for Self-Determination, an essay published in Research in African Literatures in Spring 2011. - Sénac’s series of poems Citoyens de beauté (Citizens of Beauty) were translated by Jack Hirschman in 1994, but unfortunately never published. Kai Krienke is a doctoral student at the CUNY Graduate Center in Comparative Literature. Jean Sénac's manifesto, Sous le soleil les armes, is part of his dissertation on revolutionary poetic language in the post-colonial world. He also teaches 19th and 20th century global literature and poetry at the Comparative Literature department of Queens College.